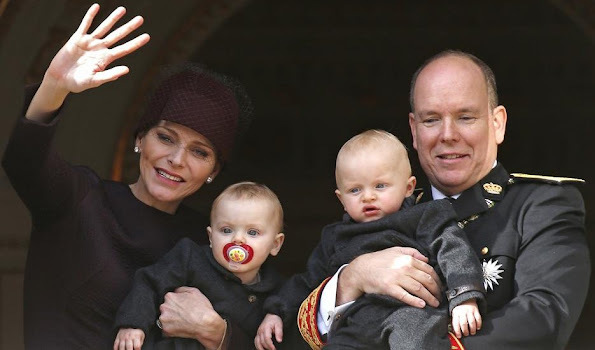 Princess Charlene doesn't know how to chose nice clothes for her children . ...so lovely the cuties, adorable ❤ Charlene is a caring,affectionate and loving mother. Albert seems a bit uncertain in practice. Gabriella has very beautiful eyes she looks after Albert. All in all proud parents. On the inter-martial level, it seems looking different. This formal occasion do not allow a casual style. If she dressed her cuties kitchy, what would you have said? Babies dressed in dark grey/black? I don't think so, poor kids. Charlene's dress is a disaster, I've seen other pictures and the (stiff) hem of her dress is dipping down in the back (on purpose). The effect is horrible. The hat is one of those egg-warmers I suppose, designed to hide her military haircut. She carries no bag and waves her empty ungloved hands about when walking to the car. Seen as a whole the proportions of this outfit are completely off. She should fire her stylist right now! The little girl is in a light colored dress as the first photos show. the boy has dark trousers but his other clothes are not visible under the jacket. Most high end European children's boutiques have their winter dress coats in dark tones (Bonpoint, for example). More traditional and less likely to show smudges. Seems to be a pretty harsh condemnation overall. 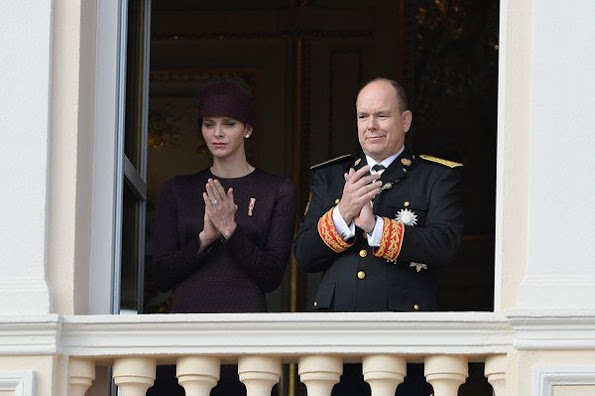 I don't think that is her best hat look and the dress is stiffer than I would prefer but it is quite in the style of French couture in the moment and very appropriate for the event. The colors are dark but most of their appearances since Friday they have worn more than usually subdued colors in respect for the events in neighboring France. Monaco is one of the few countries I still see observing that traditional idea- Though the Dutch royals did tone their normally colorful wardrobe after the air disaster earlier this year too. I was more struck by how much they seem to enjoy being parents and how much more relaxed they both seem since the children's birth. 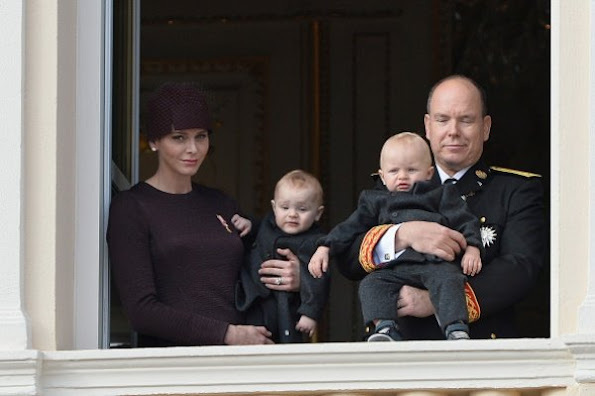 The babies are just as smart and chic as Princess Charlene. Her decision how to dress her children. 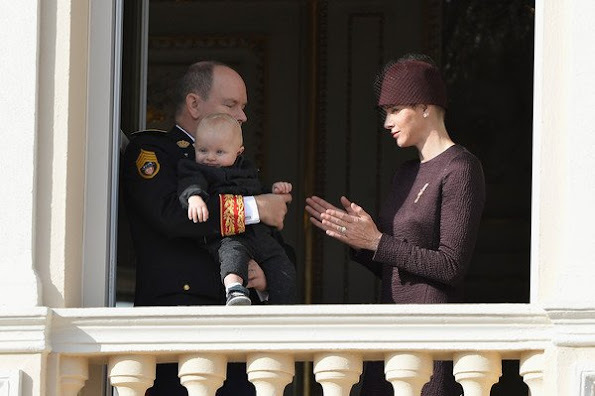 Princess Charlene don't need to change her style. It suites her. Beautiful different. You seem not to realize that Monaco has a "deuil" (french word) during 3 days, because of the "attentats" in Paris. That's why the babies are in dark. I wouldn't wish to be holding a potentially wiggling baby that age wearing gloves that high up on a balcony, and with cobblestones below! Both mine would unexpectedly throw themselves backwards with more force than I could believe at that age- which is typical. Slippery gloves cannot grasp the children's coats as firmly as bare hands. Not sure why the above poster considers it so gauche as Charlene did wear gloves for most of the day's events, unlike any of the men and many of the other women of the family (Caroline's odd white glove being the exception). I don't love the hi low hem but it is everywhere in couture at present, as is that color and hat style. So she is certainly on point whether you like the effect of not. I believe Anonymous 19:23 made this comment in answer to Shellsea's complaint about Charlene's "empty ungloved hands". And as Anom tried to point out, Charlene did wear gloves for the service. 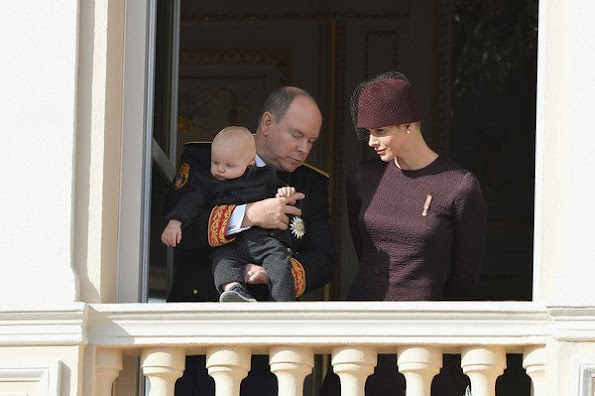 See here: http://www.newmyroyals.com/2015/11/monaco-national-day-2015-celebrations.html Only not on the balcony, where she also handled the twins. 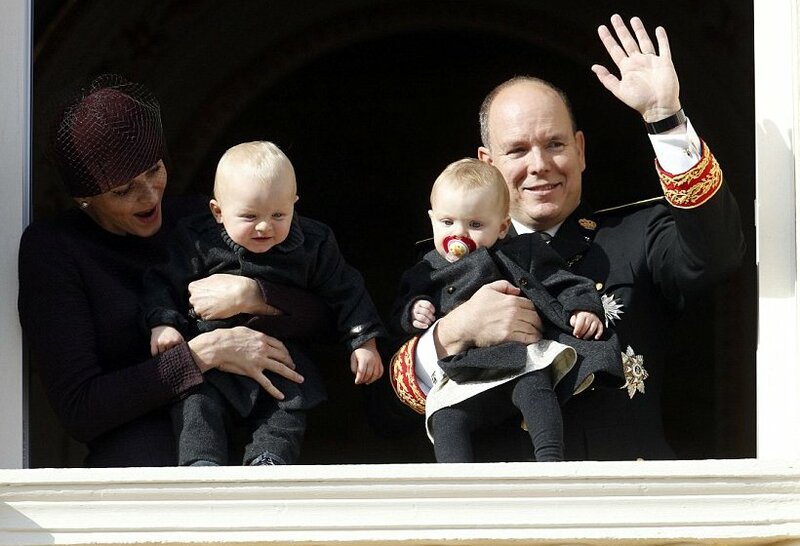 What I notice about the children, is they are warmly dressed and the parents beam with pride when they are around. I really do not see the criticism about the color of the children's clothing. It looks traditional to me. 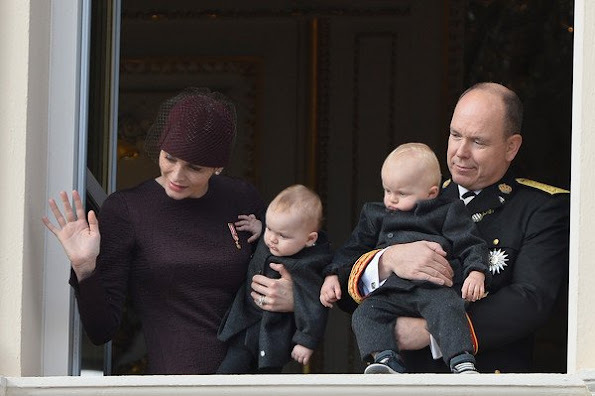 Princess Madeleine posted a first photo of her newborn son wearing a knitted one piece in grey. I loved it! Agree, Anons 18:59, 17:49, 17;45, 18:53, 19:23, 20:22. I consider each person's outfit appropriate, for all the reasons cited above; plus I absolutely adore every bit of Charlene's edgy look. And as some have remarked, it's lovely to see the family so relaxed and happy. I'm not sure Charlene and Albert can have much contact with their children judging from the most awkward ways they hold their children. It looks terrible, ok they be wanting to show them to people but surely sitting on the hip of the parent would be better for all like Prince William does with George. 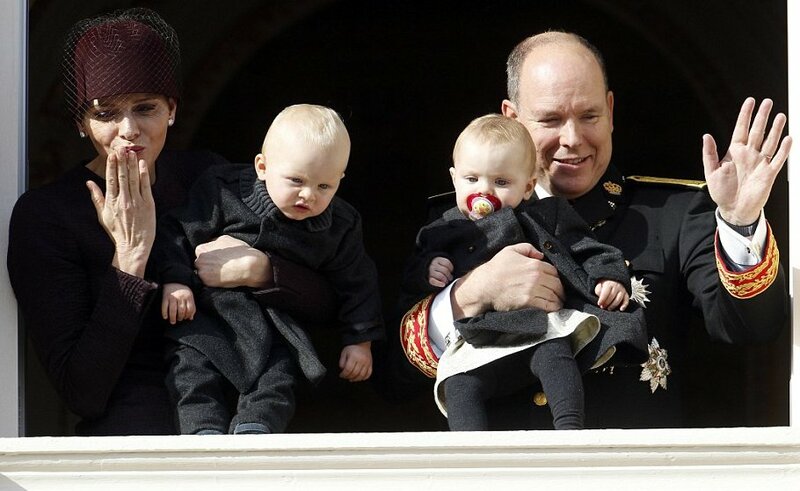 As for dressing babies in black quel horreur. The mourning colour for children is normally white and if they wanted to show respect after the Paris attacks this is the colour the children should have worn. Charlene looks like she has a flower pot on her head what was she thinking? Total disaster sartorially for all except Albert in his uniform! wat heb ik genoten van de kindjes schattig !!!! en charlene ziet er heel modern uit ,en ze kan het hebben. er straalt er van af ,dat ze heel gelukkig zijn !! I love her look ! The children are dressed appropriately for the occasion and recent events. As usual Charlene is the epitome of elegance and the twins were dressed in the way that European Royals dress their children, nothing extravagant. I think that the person that said that Charlene was wearing gloves when she was holding the children in the balcony should see an eye specialist. Also the person that said that Charlene and Albert do not have contact with their twins is absolutely in the wrong. Charlene has never left them since day 1 and Albert is always present ; when his official duties allow him. They are a very happy family. God Bless them.